We’ve focused on techniques in this column up to this point. Now it’s time for some small tips that can make a big difference! 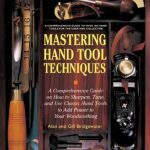 Here are some woodworking tricks that I have found useful for automaton-making. 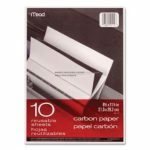 I often use carbon paper — the kind used for making duplicate copies on a typewriter — to transfer patterns from paper to wood. The process is as simple as placing the carbon paper on the wood, then the pattern on the carbon paper. Finally, trace the design with a ballpoint pen. In a pinch, you can make your own transfer paper. Take a plain sheet of paper and cover every bit of it with pencil marks. Next, dampen a rag with a little lighter fluid. 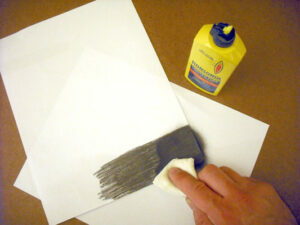 Wipe the surface of the paper with the rag to spread the graphite around evenly. Your homemade carbon paper is now ready to use. For years, I thought that when I bought a new woodworking tool it would be ready to use right out of the package. Not true! If a new tool isn’t performing as expected, this could be the reason. Chisels and planes often have milling marks on surfaces that should be mirror-smooth. Saw teeth are often set too aggressively and carving knives are not truly honed to a sharp edge. 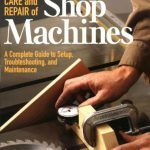 Whether it’s a power tool or a hand tool, do some research about how to setup and maintain any tool you acquire. You will be amazed at the difference this makes! Carving tools need to be protected. You may have spent a lot of time sharpening a tool. You certainly don’t want to ding that perfect edge. For safety, you also don’t want to that sharp blade exposed when it is not in use. Wine bottle corks — real or artificial — make great covers for carving knives and other tools. 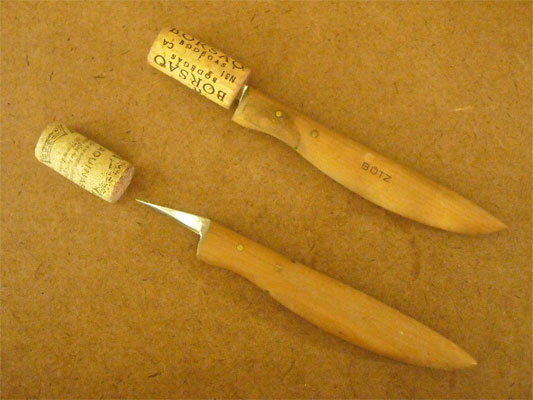 Simple press the blade into the cork until it covers the sharp edge. Oops! So you drilled a small hole where you weren’t supposed to. Now what? 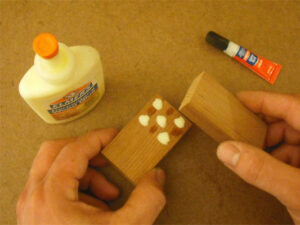 You could start over, or you could mix some of the leftover fine sawdust and ordinary white glue into a putty. 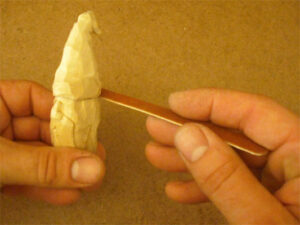 While still pliable, press the putty into the space that needs to be filled. When it dries, sand it smooth. The repaired spot should be a fairly close match to the wood itself. The cosmetics section of your local store has many useful tools and supplies including tweezers, lacquer-based paint (a.k.a. nail polish), acetone, cotton swabs, and cuticle scissors. 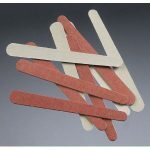 Emery boards used for fingernails make handy sanding sticks. Not only are they inexpensive, but they often have two different grits of sandpaper. They are great for getting into tight areas where a sanding block is too big and a folded piece of sandpaper is too floppy. Even when you have pre-drilled a hole into the wood, sometimes woodscrews just don’t want to go in. This is especially true when drilling into hardwood. To make things easier, rub an old candle on the screw and try again. 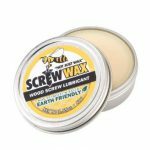 The wax acts as a lubricant to help the screw go in. ChapStick also works great for this purpose. At last there is a use for that last little bit of ChapStick left in the tube! Drilling round holes can really help your machines run more smoothly. 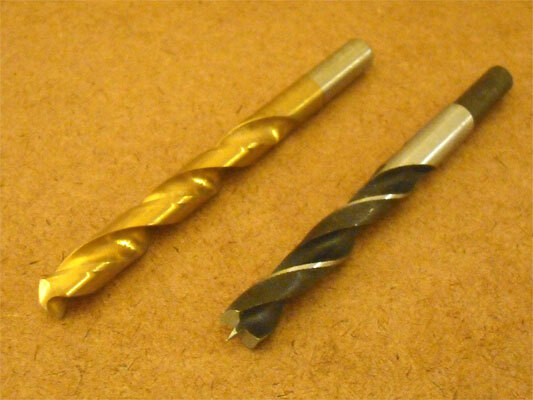 Standard drill bits have a tendency to make holes that are not very round. Brad point drill bits do a much better job. Not only does the sharp point help you to position the hole more precisely, but the two outside cutting tips score the perimeter of the hole, while the inner edges chisel it out. This helps to ensure that the resulting hole is round and smooth. Working with small pieces is a big part of making an automaton. Sometimes these pieces can be very hard to hold, and to work on with a tool. I use a jeweler’s ring clamp to hold small parts. 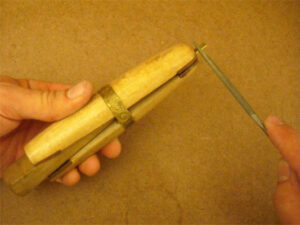 The part is placed between the leather tips and a wedge is driven in the opposite side, holding the piece firmly. The leather doesn’t mar metal pieces like a vise might and you can bring the piece to a stationary tool such as a belt sander. If you ever need to drill a hole to a specified depth, wrap a piece of masking tape around the bit at the desired spot. Leave some extra tape to form a flag that sticks out from the bit. Drill the hole and watch as the spinning tape approaches the surface of the wood. When the tape sweeps the wood shavings from around the edge of the hole, you know you are close. 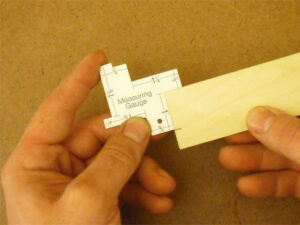 This little gem of a tool is a measuring gauge made out of aluminum. It has many sides, each of which is a specific measurement. There are 14 in all. 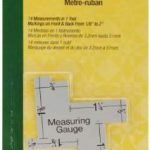 This is really handy for marking commonly-used measurements. You might guess that I found this at a specialty woodworking store. Actually, I found it in the quilting section of a fabric store! Super Glue cures very quickly, but it doesn’t hold up to shock very well. 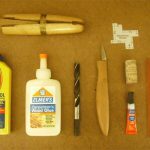 Depending on what you are gluing, a different type of glue might be a better long-term solution. Why not use both? 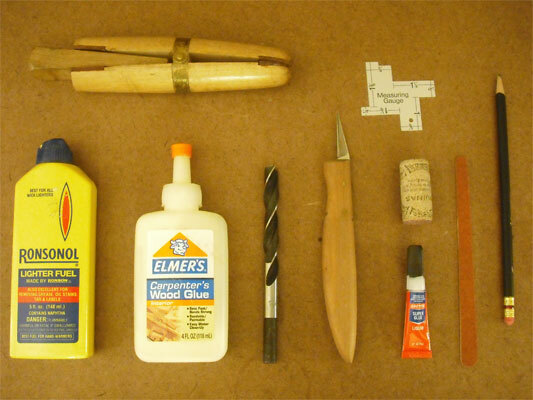 For example, you can use some spots of yellow wood glue to hold the pieces together long-term and some spots of Super Glue to serve as a clamp while the other glue cures. Instead of drawing all over a piece of paper with a pencil you can buy graphite powder and do it the easy way. Pour a little bit on the paper and rub all over with a tissue, then go wash your hands and check your face in the mirror cause we all know you scratched your nose a few times and now look like a chimney sweep. Great idea, Beth! If you’ve got graphite powder on hand, use it! 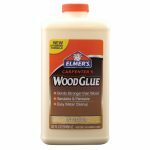 It also makes a good (but disagreeably messy) lubricant for wood-on-wood mechanisms. My favourite, Super glue as a clamp, what a great idea! Glad you like that one, Michael! Of course it’s a bit of a compromise because you cannot spread as much of either glue type. Still, there are times when it is helpful. 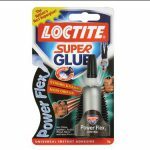 Have you ever used the Super Glue activator? If you haven’t, give it a try. A quick spray instantly (or, even MORE instantly) hardens the Super Glue. Usually, the fine line of Super Glue on the exposed edge of a bond is enough surface area for the activator to hold the pieces in place until the rest of the glue dries. Good to see the Tips, Techniques, and Tricks still coming. On #3 I’ve seen pieces of “Pool Noodles” glued to base(piece of wood) used as pin cushions for carving knives and related sharp tools. If you like to switch tools often while carving this may help. #5 & #10 Right On! I’ve always been surprised by how many tools and supplies I’ve found in “unusual” places. Lately its been about making fishing tackle and so many items from places like the cosmetics sections can be used for making lures and the like. For #6 if you use a lot of screws in the workshop some people like Toilet Wax O-Ring. It sounds kind of weird, but its soft and cheap and can be used to help keep track of screws. Thanks, Dean! By “pool noodles” do you mean that colorful open-cell foam? That’s a great idea for keeping all your sharp tools close by and protected. As for #5 and #10, I have found that some specialty retailers are somewhat sneaky. They find a tool or material and market it in a clever way at a high price. If you look around, you can often find the SAME thing being sold to a different market for much less. It pays to keep your eyes open. I hadn’t heard of using the wax toilet O-ring for driving screws. It’s soft wax, so that makes sense. @Dug, Yes those things can be found extremely inexpensively. I couldn’t find a picture of an example of a holder(and my workshop is a mess to take one). But I did find an instuctable of a brush holder using the similar pipe insulation that could be done using pool noodles also. It is amazing how much supplies and skills can crossover to other interests, when you keep your eyes and mind open. I’ve stopped using aliphatic and pva glue. Reason being I recently discovered that seccotine – a liquid hide glue – is still availablei. n my book it’s the best. It is however, not waterproof. But since all antique furniture and wooden music instruments were built using it, I’m not worried as the work I do doesn’t go outside! Lucy Coad at http://www.squarepiano.co.uk/shop.html Supplied me with a couple of 500ml bottles which should keep me sticking for a while! Great tips in your column, Dug, thanks! I’ve heard great things about hide glue. The glue pot for heating the glue sounds like a bit of a hassle, but I’m sure there are clever solutions for that. What do you use? Or does the seccotine not require heating? Tightbond sells a modern-day hide glue that doesn’t require heating. I’ve heard good things about it, too, but you have to be aware that it has an expiration date! Seccotine comes in plastic bottles, so no heating. I’ve just edge glued lengths of lime together to make a sea-base for a ship. After cutting to length I tried to break apart the pieces of the off-cut. I couldn’t. Hide glue, liquid or traditional is generally reckoned stronger that PVA or aliphatic resin. I think it has quite a long shelf life. The lady at square pianos can probably give you a better idea. Ever noticed that when nailing or screwing into a narrow piece of wood, it splits.Drill a suitable hole before you begin, or blunt the point of the nail or screw. If nothing is going right, go and have a cup of tea, it’s amazing how things change on your return. If in the US, try coffee, the tea is awful. Those are all tricks I’ve used and they all work. Thanks for sharing. This is some really good information about mechanical milling. I liked that you pointed out that drilling better holes can help a machine work better. I didn’t realize that rounder they are the better it will work. 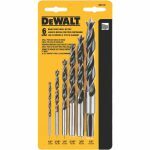 It seems like those drill bits would make a great Christmas present for anyone who does milling.